experience luxury loft living downtown los angeles. 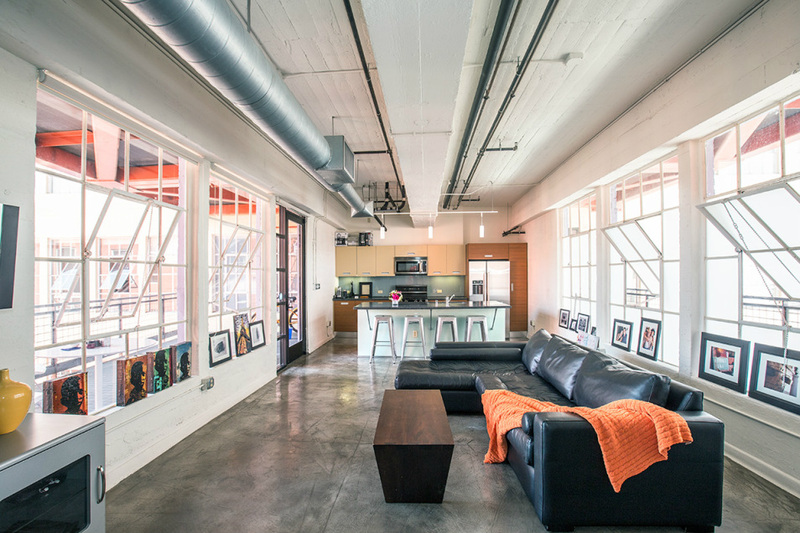 bright and airy live/work loft for rent with many convenient amenities available. INDUSTRIAL LOFT WITH A SEPARATE BEDROOM AND BALCONY. Located in the Fashion District and built in one of the original manufacturing buildings, this rare loft with large balcony, 1 bedrooms, Jack and Jill bath, polished concrete floors, an open Kitchen with Modern Cabinetry and Stainless Bosch Appliances; Full Bathroom with Stackable Bosch W/ D and Granite Counters. Energy-Efficient HVAC System. Comes with 2 deeded underground parking spots. Historic Bldg (1922). Santee Village is an Urban Community at the intersection of the Fashion District and Historic Core, with Amenities that include Rooftop Pool, Spas, Fitness Center, and Gourmet Market. 24-hour Courtesy Patrol, On-Site General Manager, Secured Access. Blocks to the best Restaurants, Nightlife, and Shopping in Downtown, Short Walk to the Metro and LA Live. This unit has a HUGE PRIVATE PATIO (400+ SFT) with breathtaking views of the skyline and the Mountains.